Once in awhile New York will surprise you during the winter with an unseasonably warm day (well, 45 degrees as opposed to 30, that is), giving its residents the perfect opportunity to shed some layers and finally enjoy some time outdoors. It's moments like these when I love that my building has roof access, giving me a bird's eye view of Brooklyn during one of the most picturesque times of the day. 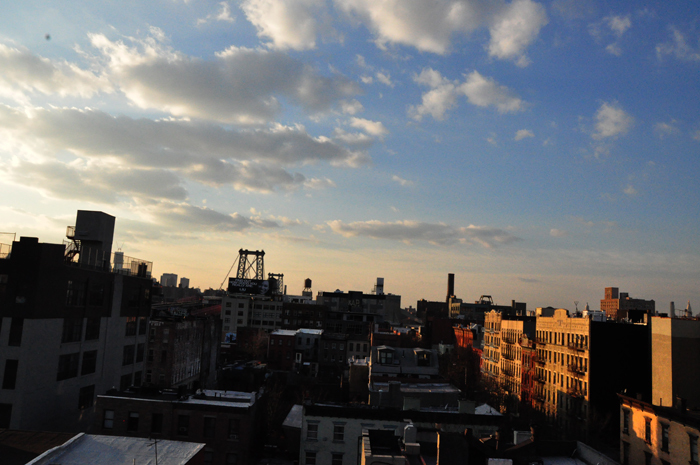 While we were up on the roof, Micol commented, "There's no time quite like sunset in Brooklyn," and I have to agree. Bikers pouring over the bridge to escape a long day of work in the city, trains flying back and forth over the East River, the sun setting lazily behind the tip of Manhattan. It doesn't get much better than this. Beautiful dress!! I love the high low cut! I wish I had a roof that I can take pictures on while the sunsets. I also agree with Micol there is nothing like a Brooklyn sunset. Even the sunrise is beautiful in BK. <3333 brooklyn! That dress is insane ! I love that cut out on the back ! Love the pattern on this dress and the cut-out in the back. So gorgeous! I love your post! Great style and setting! the cut of your jacket is very nice! WOOOW...YTOU LOOK GREAT!....YOU HAVE A WONDERFUL FACE ! REALLY COMPLIMENTS! Love rooftop photos. Very beautiful. OMG!! I ve passed by your blog ans I totally loved it! Its awesome!! Would like to check out mine and follow each other if you like?? Your dress is gorgeous, I love the back! You make me want to pack up my bags and move to New York. Seriously stunning view of that shot! Rooftop shots are always the best! Love the first shot! I really love the print of that dress! So cute! So happy to have just discovered your blog! She looks fabulous. Gorgeous jacket. Love the pictures!! adorable outfit and pretty you..
would you like to follow each other..??? Also, I made 2 purse clutches and I'm giving away one of them - you can pick which size you like! Check it out here! adore that dress. totally devine photo. youre so pretty! what a fabulous look, i love your dress paired with the coat/top!